This week I’d like to write about our newest little granddaughter, Katelyn Seraphina. 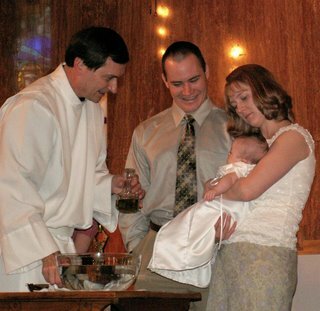 Katelyn Seraphina entered the world on June 7, 2006, and she was baptized at St. Isidore’s Catholic Church in Manhattan, Kansas, on Sunday, September 17th. 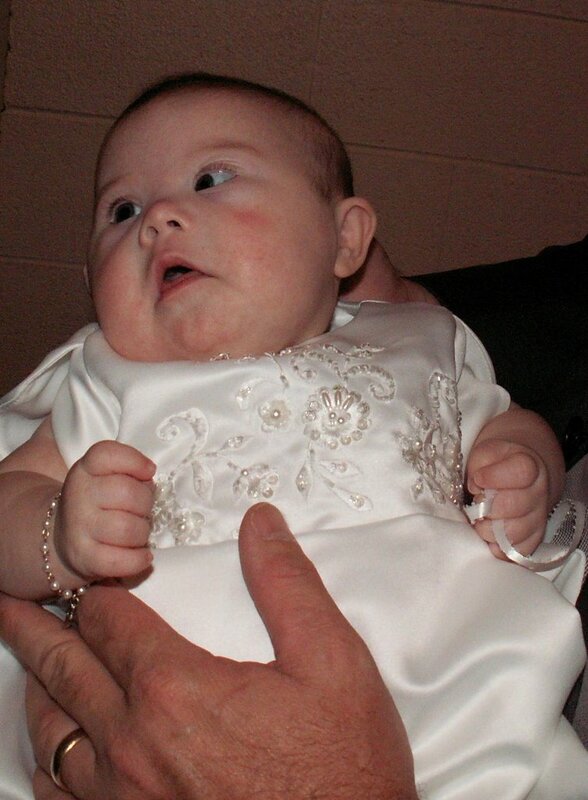 Down syndrome is a chromosomal disorder that affects one in every 800 live births. It is one of the leading clinical causes of intellectual disability in the world. Individuals with Down syndrome are at higher risk for medical problems and language delays. Quality educational programs, along with a stimulating home environment and good medical care, enable individuals with Down syndrome to become contributing members of their families and communities. Approximately 4,000 babies are born in the United States with Down syndrome each year, affecting about one-quarter million families. There is a wide variation in the abilities, physical development, behavior and personalities of individuals with Down syndrome. Individuals with Down syndrome benefit from loving homes, appropriate medical care, inclusive education, and positive public attitudes. When we realized that there was a problem with Katelyn, it was such a shock because it was so unexpected. My heart literally ached for our son Josh and his wife Lisa. No one expects to give birth to a baby with special needs, so when it happens, your head just starts spinning as you try to grasp the magnitude of the situation. I still remember when the doctor came into Lisa’s hospital room after examining Katelyn. She explained that they were “suspicious” that Katelyn might have Down syndrome, but they wouldn’t know for sure until the test results came back. 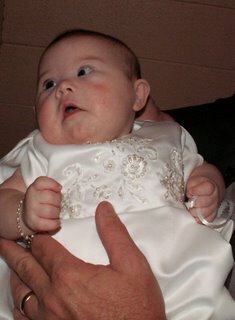 With the greatest sensitivity and compassion, she shared that two of her closest friends had babies with Down syndrome within the last year and they both express the great joy their babies have added to their lives. With tears in their eyes, Josh and Lisa listened intently and nodded in agreement. 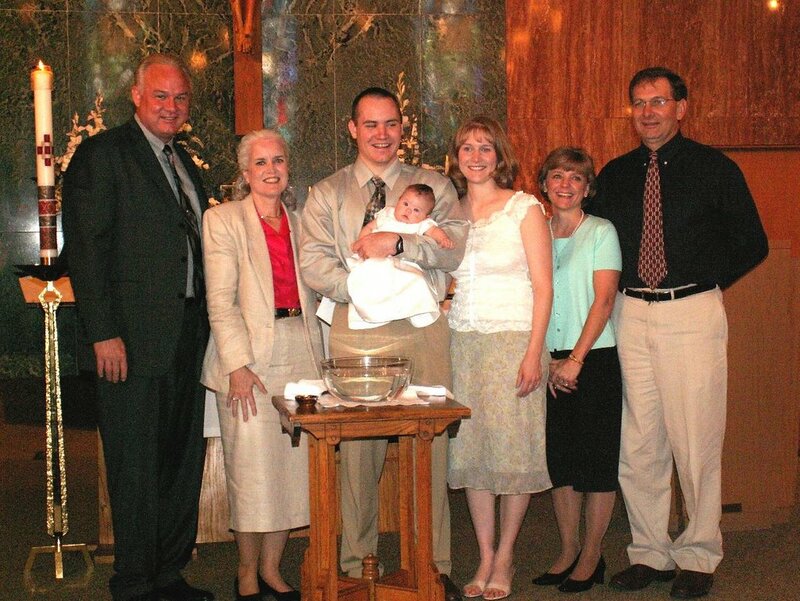 “God chose us to be Katelyn’s parents,” Lisa said. After the doctor left, Josh looked around at all the grandparents gathered in the room. “There are an awful lot of gloomy faces in here,” he said. It broke my heart to think that Josh might have felt – for even one moment – that we were somehow disappointed with Katelyn. It was just so hard to adjust to the news at first. His phone call was a great encouragement to us, and after that Keen and I didn’t waste another minute feeling sad about what Katelyn didn’t have. We just started thanking God for the miracle of her birth and the wonder of her special little life. From that day forward, we have cherished every moment with our granddaughter – and we couldn’t love her more if we tried. Mom and I want you to know that we are so proud of you. We are absolutely thrilled with our new granddaughter, Miss Katelyn. She is so profoundly precious to us. She is only 48 hours old and she has brought so much love into our family. I can only imagine what it will be like in a week, month and in years to come. I’m so happy and feel so blessed to have Katelyn in our lives. We are merely audiences to the wonderful blessing God is bringing into our lives. This is truly a time for celebration!! Mom and I plan on coming up Saturday. When you are done with work, we’ll barbeque and then go to a driving range and crush some golf balls. I love you, Josh and Lisa. Thankfully, Katelyn has a healthy heart and is progressing well. She’s alert, active, and aware – always looking around at the people and things in her range of sight. If someone new comes in the room, she notices and turns her head in the direction of their voice. She is tracking objects very well from left to right and up and down. I think I already bragged about how she flipped from her tummy to her back when she was only 5 weeks old! Last week I spent the night at their house and attended Katelyn’s group therapy session the next day. She had music therapy, did some work on an exercise ball, and had a baby massage. She has two to three classes a week including speech therapy, physical therapy, and occupational therapy. Katelyn’s only issue has been with feeding. She doesn’t always take the amount of milk she needs to have in a day, so her “Super-Mom” Lisa will often set the alarm to feed her in the middle of the night, even when Katelyn would have kept sleeping. Katelyn is such a contented little one. She rarely cries, so when she does cry, you know that something is really wrong. We are so proud of the way Josh and Lisa have handled everything. Josh told us that during the first few minutes they had alone with Katelyn after her birth, he and Lisa prayed together and asked God to give them the strength and guidance they would need to take care of their special little girl. Josh and Lisa are the best parents Katelyn could ever hope to have. Recently Lisa said, “At first we wondered what our life would be like with her, but now we can’t imagine what our life would be like without her.” Lisa told me that she wouldn’t want Katelyn to be any different, because then she wouldn’t be Katelyn anymore. “Josh and I are just crazy about her,” she said. “Hello everyone, as a new daddy I proudly get to show off photos of my new baby girl to everyone I meet and go on-and-on about how great she is and will be. I'd like to introduce all of you to Katelyn Seraphina Umbehr, who came into this world on 6/7/06. Little Miss Katelyn weighed 8.09 pounds, was 17" long, and caused her mother to go through 11 hours of drug-free labor (although her future siblings probably won't, Mom says). Our little bundle of joy had a rough start at life and will be staying in the capable hands of the Shawnee Mission NICU for a little while. Miss Katelyn has Down syndrome, a murmur and a touch of pulmonary hypertension, so we're all just praying that she comes through everything ok. We're thanking God for 10 fingers and 10 toes and the rest is just bonus. Please keep us in your prayers and check out the pictures of the newest [member] of the Umbehr family. PS - The fact that her initials are KSU (our alma mater) is purely coincidence :) Katelyn is the name my mom had picked out for a girl but never used b/c she had all boys and Seraphina is the name of Katelyn's Great-Grandma whom Lisa adores. (chorus) Sometimes miracles hide, and God will wrap some blessings in disguise, and you may have to wait this lifetime, to see the reasons with your eyes, cause sometimes miracles hide. Though she was not like the other girls they thought she was the best, and through all the years of struggle neither whispered one regret. And the first day that she started school and took her first bus ride, they’d remembered the words that God had spoke and they both broke down and cried. You see to them it did not matter, why some things in life take place, cause they just knew the joy they felt when they’d look into her face. They learned that sometimes miracles hide, they said God has wrapped our blessing in disguise, and we may have to wait this lifetime to see the reasons with our eyes, we know sometimes miracles hide. We’ve learned sometimes miracles hide. You’re so right, Lisa. She already is. As my friend Barbara Lerma said, she is that “pearl of great price – a sweet little pearl to treasure and love.” Miss Katelyn Seraphina Umbehr. Our little angel in disguise. Or that life is fighting you? Because I have felt that way, too. We just start over and repeat our turn. And His desire is that we be blessed. That we did what we did for their sake. From beginning to end and in between. And for His strength daily I will pray. In 1981, Rabbi Harold Kushner published a book titled, “When Bad Things Happen to Good People,” which later became a #1 bestseller. The publisher’s comments listed on the Barnes and Noble website describe how Rabbi Kushner wrote the book after learning that his three-year-old son, Aaron, would die in his early teens from a rare disease. I think it is understandable for those who are confronted with tragedy in their lives to wonder why this particular event happened to them or their family. We often ask what we did to deserve this, as if it is some form of punishment for past sins. But that is simply not the case. In the Book of Job we read that Job was a man who was “blameless and upright, one who feared God and shunned evil.” Our righteousness - or lack thereof – has nothing whatsoever to do with the amount of tribulation in our life. If we look at the life and death of Jesus Himself, He prayed that if possible, His cup of suffering could pass from Him. But then He added, “Not my will, but Thine be done.” Jesus realized that there was so much more at stake – indeed, the salvation of all mankind. In the same way, we need to realize that sometimes our troubles are not about us, but about how God can miraculously use difficult situations in our lives to help multitudes of others cope with the struggles in their life. Rabbi Kushner stated that he not only wrote his book out of a need to process his own grief, but in hopes of helping others who might find themselves facing a similar situation. “I am fundamentally a religious man who has been hurt by life and I wanted to write a book that could be given to the person who has been hurt by life, and who knows in his heart that if there is justice in the world, he deserved better... If you are such a person, if you want to believe in God's goodness and fairness but find it hard because of the things that have happened to you and to people you care about, and if this book helps you do that, then I will have succeeded in distilling some blessing out of Aaron's pain and tears." I think that’s what we all look for in times of trial – a way to garner something positive out of an event that is seemingly wholly negative. In the case of my cancer diagnosis and subsequent mastectomy, it is my deepest desire that the good that comes from it could very possibly be lives saved – lives of women who, after reading or hearing about my experience, will themselves get the mammogram they have been putting off. In so doing, maybe some of them will be fortunate enough to catch the disease at an early stage so that they will be able to treat it and go on to enjoy a long and healthy life. Yes, that is my heartfelt prayer. “Don’t forget me.” Those were the last words I ever heard our dear friend Quentin Katt say before he lost his battle with cancer one year ago. Quentin passed away on his 72nd birthday, September 13, 2005. 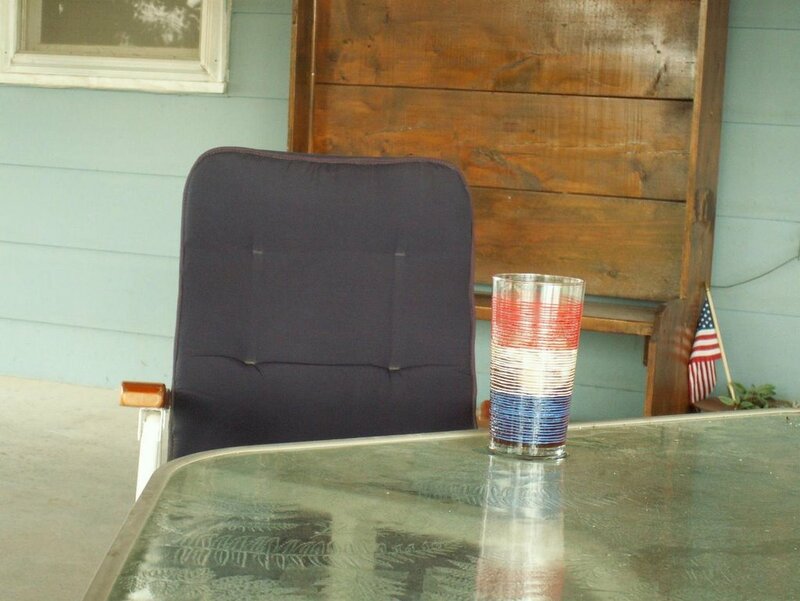 Quentin enjoyed the simple things in life, but he was anything but simple. He and Keen would often have deep philosophical conversations. When it came to politics, they couldn’t have been more opposite – but that’s what made their conversations so lively and stimulating. Quentin’s shop was a safe place for Keen to go and let off steam. Quentin was always there to lend an ear and offer a word of sage advice. Keen learned so much from Quentin. 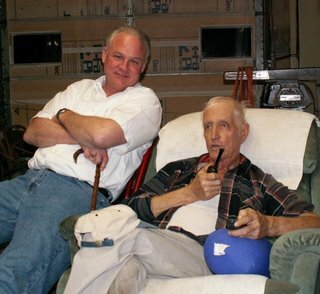 One of the things he learned was a lesson contained in Quentin’s favorite poem – a poem titled “Outwitted” by Edwin Markham,which was published in the program for Quentin’s memorial service. Quentin and his wife Aleta raised six wonderful children; three boys and three girls, who are all living happy, successful lives and raising children of their own. Their daughter, Diana, became a doctor and returned to her hometown to establish a medical clinic. Quentin’s philosophy of life was described in a wooden plaque that hung on the wall of his garage. “He who dies with the most gold still dies.” At his memorial service, Quentin’s son mentioned that some of his dad’s most cherished possessions were artifacts Keen Umbehr found on his trash route. Forget you, Quentin? Not a chance! Until we meet again, old friend, we will be remembering you.